This article is about the use of hydroton. We have received many queries about the pros and cons of expanded clay pellets. These are the best grow medium which indoor growers can use to grow any plant easily. They have their own benefits and drawbacks. Today we are going to discuss everything about the use of hydroton. First of all, we want to tell you these are not rocks as most of the grower assume, they are. They are made of clay as the name suggests (expanded clay pellets). They work best with a hydroponic garden. The number of benefits is depending on the use of hydroton or how they are used in the growing system. You can use them in every growing system with all types of grow lights. But they work best if are used with the hydroponic garden where we use water rich solution (not soil). We do not advise you to mix them with the soil. They are costly and the idea of mixing them with soil is something different which is great to try but we already tried it and did not get any change in plant growth. Do not waste your money by combining the soil with clay pellets. Water drainage (plant protection): Large aggregates like clay pellets are filled with tiny holes these are called micro holes. They work like a sponge or a microsponge which holds the right percentage of water and nutrient-rich solution. It will drain the excess of water in case you put more water by mistake this action protects the roots of plants. The water holding capacity of clay rocks give constant moisture to the plant root and prevent dry conditions even in hot weather. This is the reason they are suggested to be used in hydroponic growing. Air intake: The most important thing that plants and everybody on the earth need to live is air. The tiny holes prevent the blockage of any kind and hence allow air circulation. This way plants get sufficient oxygen to grow as fast as possible with having any disease. If plants do not get enough of air their leave will turn yellow (pale) and a plant will die in a few days. Reusable: Now this the best part that we like about them. They are the reusable growing medium which saves your money because you can use them as many times you want. Take out the rocks wash them to remove organic matter and they are ready for reuse. When you see extreme salt build upon them then it is a time to change them and buy another pack of clay rock. Easy to transfer plants: Hydrotons are the loose medium so it is easy to transfer any plant from one plant to another place. Pulling out plants from soil is not that easy as it is from the hydroton grow rocks. Sometimes people need to put their hands more often in the growing medium so they use these grow rocks to avoid any damage to the plant. It also makes it easy to work on the plant every day without interrupting their growth. Prevent bacteria and insects: Expanded clay pellets do not contain any nutrient for plants. They are used to hold the nutrient-rich solution in them so that plants can take the desired amount of water and nutrients when they are in need. In simple words they act as a vessel for the plant this helps to prevent bad bacteria and insect attack. Which is essential for any plant growth. Benefits are not limited to above-given points but these are the main benefits that every grower want in the growing medium. 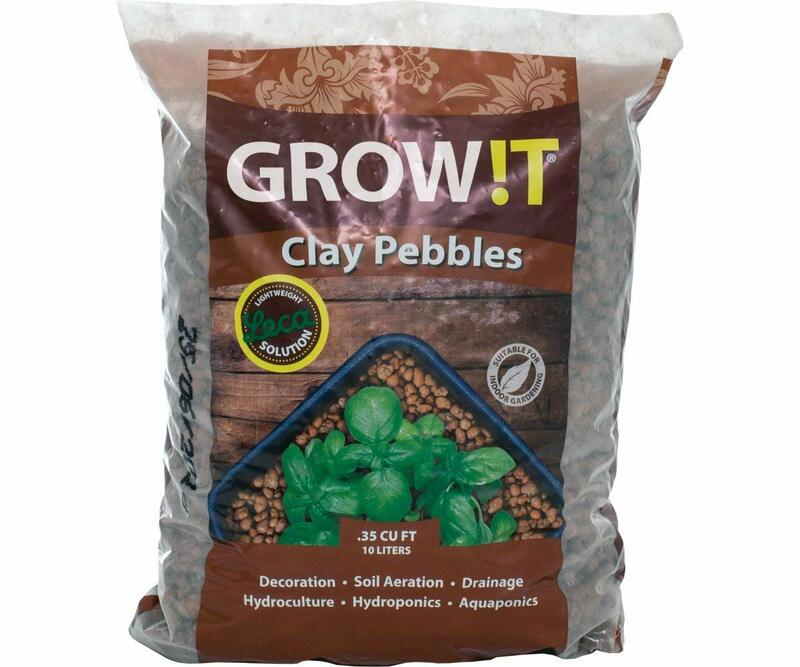 Not for Large-scale Growing: grow rocks are easy to use and available in supermarkets and online stores. They are very useful for small-scale growing (small growers) like we grow at home for our family and friends. Using them in commercial growing which is on large scale is not a good idea they are not cost-effective. Quick dry: We have already explained that they have a good drainage system where they drain the excess of water and save the plant form decay. On the other hand, this also allows them to dry quickly as compared to the soil. But we do not think this is a big issue when you have tones of benefits. The only thing that you need to make sure is the constant supply of water to the pant. These are the most popular growing medium that is used in different types of hydroponic systems. They are light in weight, sterile, easy to transplant and harvest. Use them in DWC, Ebb & Flow etc. Caution: while using them in the hydroponic system make sure that your plant gets the constant supply of nutrient rich solution because expanded clay rocks do not have much water holding capacity. They dry out in a very short time. Do not try to crush the pellets this will results in blockage of water flow because the crushed pellets will flow away from their place. In hydroponics, we only use water instead of soil so it is better to use grow rocks than other growing medium. Before using any growing medium identify what your plant needs to grow healthy and strong. If you do not have enough time for your plant and want a solution of frequent watering than use hydroton with soil. This help to reduce the water frequency because whenever you put the water into the pot the pellets absorb the desired amount and the excess of water will drain down into the soil around the roots. This help to keep the pellets moist all the time and you do not have to give water to the plant more frequently. Some plants need to retain the water rather than aerate the soil. Soil also gets dry in dry weather especially in summer and to overcome this problem crush the pellet and mix them with the soil. This helps to lock the moisture into the soil for a very long time. They are an important growing medium in many growing methods so it is not hard to find them in a local store. Find a hydroponic store or garden store near your place and ask them for the hydroton grow rocks. Remember all grow pellets are not same, choose a quality product. It is wise to invest in quality products rather than thinking about cheap products. Only good quality products full fill the promise. Do not use them directly, first of all, rinse and soak them in water to remove any dust and dirt from the pores. Use Luke warm water to get rid of any bacteria and open the closed tiny pores of a pellet. Take a bucket of water and fill it with the expanded clay pellets that you want to use (rinse twice). Now add the nutrient solution that you use (add nutrient to clay rocks). Some people soak them into the solution for more than 8 hours this will increase the chances of having heavy yield. Do not let them dry: Always maintain the good level of water in your system this will prevent the pellets from drying out. Because once they get out of moisture, they will start absorbing the moisture from your plant. This is the life-threatening condition for your plant. Sterilize: Before using any second time soak them in the isotopic alcohol to sterilize them. They are highly sensitive to fungus and bacteria. It is advised from the experts to sterilize them before reuse. NOTE: If you do not have a regular irrigation system then do not use clay pellets without soil. They tend to get dry more than soil. Mix soil and pellets if a water supply is not continuous. Rinse them and prevent cation exchange capacity. Pellets are used to grow and nourish your plant for its complete life cycle. There is nothing to worry about the maintenance of expanded clay pellets. These are ready to use clay rocks to grow your plants. The only thing you need to do is rinse them thoroughly before use. Below are the top selling hydroton on Amazon (these are very popular in indoor growers of Canada). They are made with 100 % natural clay and do not dry out quickly as compared tot eh other brands in the market. They also help to prevent evaporation of water-rich solution from the pot in all weathers.